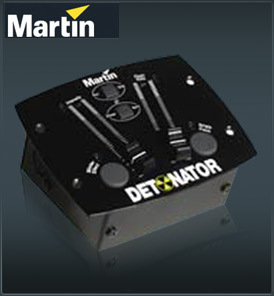 The Martin Detonator is an optional, dedicated remote control tool for easy command of the Atomic strobe’s flash rate and intensity. It includes “blinder effect” and “single flash” detonator buttons as well as a chase/synchronization toggle switch. Easy to set up and operate, the Atomic Martin Detonator requires no external power source. • Easy set-up and operation.